All Kansas Mesonet stations measure soil temperature at a minimum of two depths. This provides insight into what is going on below the surface and is vital for agriculture. Data has been recorded at the 13 original KSRE stations since the mid-1980s. At that time, soil temperatures were measured under bare soil at 2 and 4 inches. The Mesonet started recording data in 2007 at additional depths and with all sensors under sod, but it wasn't until 2013 that we standardized and started to fully maintain our soil temperature sensors. Soil temperatures since 2013 are available on our historical data page. Standardized depths across the network are 2 and 4 inches. Locations of the sensors are also standardized at all stations with all soil sensors placed four feet south of the station. Soil temperatures are highly dependent on several variables that can have local influences on the measured values and can create biases in the data. The Kansas Mesonet strives to limit these factors and make individual station data as representative of the surrounding region as possible. Soil type: Kansas has a diverse range of soil types, from sandy in the southwest to solid limestone in the Flint Hills. Often these types vary over very small distances and may not be representative of your location. Keep this in mind when using the data. Sandy soil: Grass is hard to maintain as a cover. Often, it is dug up by animals, blown away or redeposited. Anomalously high temperatures in the day and cold at night will result. Clay soil: Often the freeze/thaw process along with wetting/drying will cause uplift and/or sinking of the surface soil. As with erosion this this action can uplift or shift sensors deeper in the soil. The Mesonet verifies sensor depth during maintenance visits. Hard rock: While not a typical cover at our stations, it is possible that nearby rock is moved to an undesirable location near the station. This will influence data similarly to sandy soil. Ground cover: All stations reside on a grass surface so all soil temperature measurements are under sod. However, there are a few exceptions where grass struggles to grow and it may change between maintenance visits. Grass cover will create a slower response (flatter curve) to air temperatures. Bare soil is very responsive and will typical trend more towards air temperature. 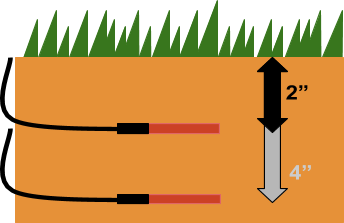 Soil depth: The depth of the sensors will often determine response to air temperature. The deeper in the soil, the slower the response time. Therefore, two inch sensors will often be more reflective of air temperature and fluctuate similarly during the day. Four inch sensors are much slower to adjust to these changes. For sensors at 20 inches, you would only notice the change of temperature seasonally. For a full explanation of how to use the page, look here. Planting: Use the map to get a regional view of temperatures and quickly identify where a particular threshold, say 50F, is to determine where planting may begin. Planting with temperatures too cold will delay emergence, and increase risk of disease. Cold impact: Roots under the ground aren’t directly influenced by air temperatures. During a cold spell however, once soil temperatures reach below 10F, wheat can become susceptible to winter kill or water pipes might be damaged. Statewide statistics: The table lets you quickly view and sort data from across the state. You can also download data to perform your own analysis (see the Download tab). Graphics and social media: Download any of the maps in .PNG format for easy sharing. 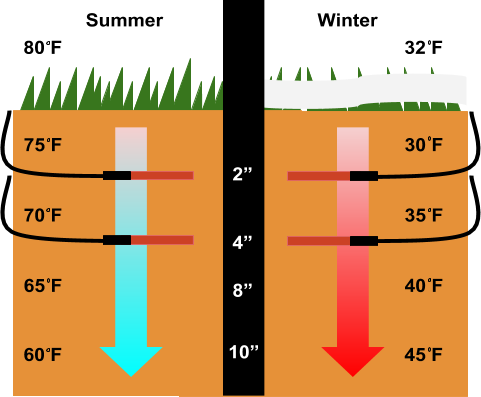 Freezing surfaces: The two inch soil temperature is close enough to the surface that ice can often implicate the possibility of frozen precipitation sticking to the surface. It can also be suggestive to future road conditions.